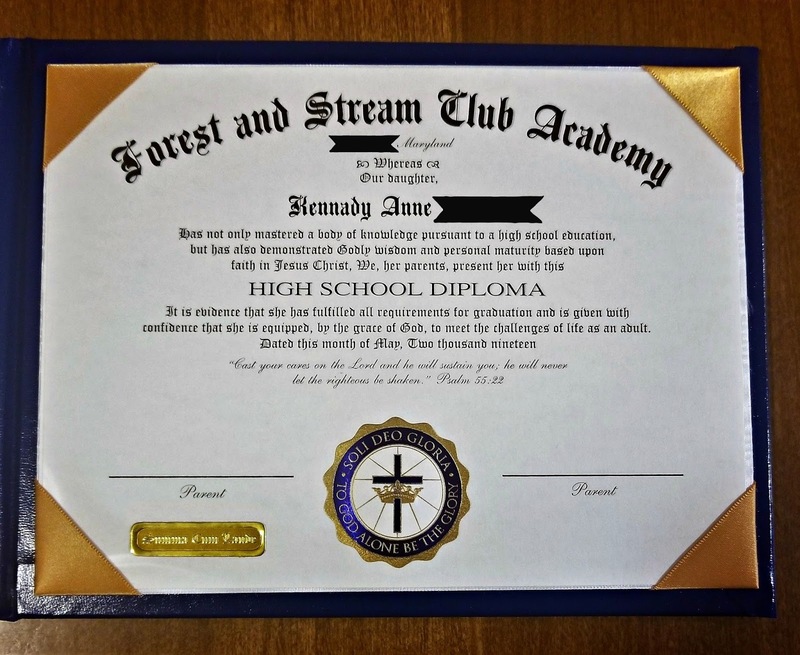 There's still a year to go before my youngest graduates, and while it may be much too early to be planning her grad party, we were still pretty excited to be able to choose a Personalized Diploma from Homeschool Diploma for this review. 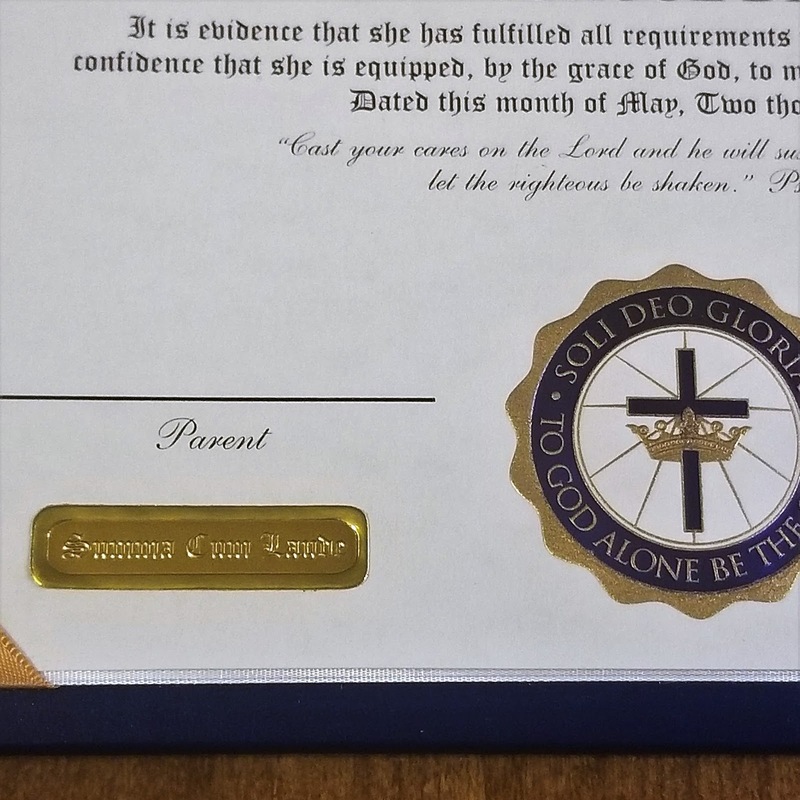 Homeschool Review Crew members are featuring the Standard Diploma in our reviews, as well as some of the other great products to help celebrate homeschooling milestones. Homeschool Diploma (or Cornerstone Graduate Supply, Inc.) is a family-owned and operated, professional graduation supply company; and they serve thousands of homeschool families every year as well as many "brick and mortar" schools. They provide high quality personalized items like diplomas, announcements, and class rings; and products like caps, gowns, and keepsake gifts to help families honor and celebrate their students' achievements. 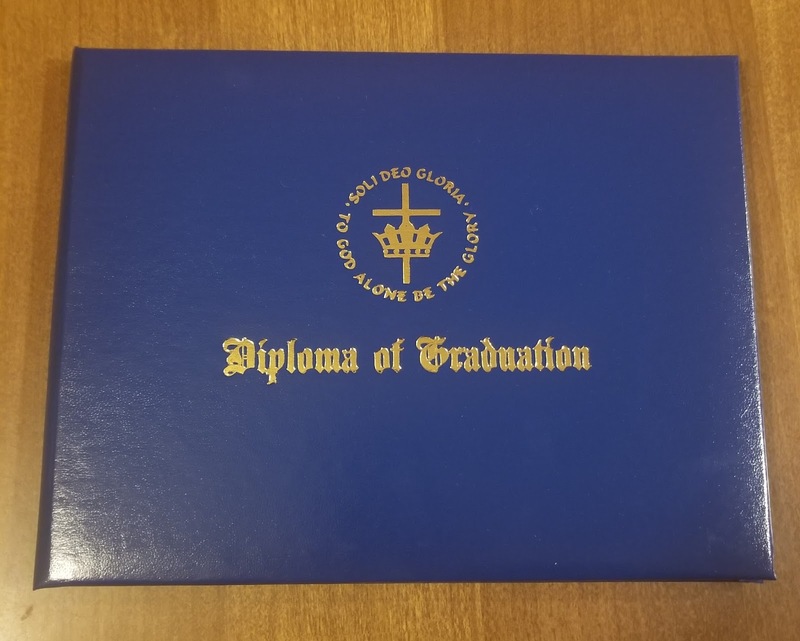 Their signature product is the Standard Diploma, which is a beautiful document customized with the student's name, school name and city, and graduation date. 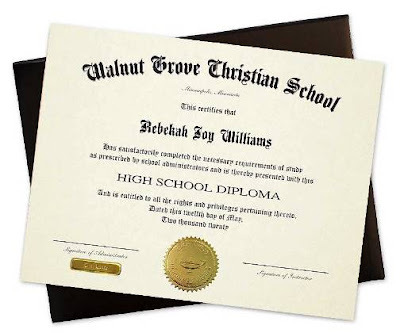 It comes in two sizes - 6x8 or 8.5x11 - and is a simple but elegant way to mark a graduation. This is an example of the Standard Diploma, so you can see how it's presented. The online form for customizing the diploma is step-by-step and very easy to follow, and includes options for the wording and other details. Everything is explained right in the form, and there are several chances to double-check that you've entered all the information correctly. Instead of the Standard Diploma, Kennady and I chose the Personalized Diploma. It comes in the same choice of sizes, but there are more customization options, such as wording choices, embossed seals, calligraphy, and room for a verse or motto. We wanted the 6x8 because that's the size we chose for Landon, who graduated in 2016, when we first reviewed these diplomas! Here you can see her diploma (a little bit of personal info blacked out - thanks for understanding!) and a bit of detail. We could choose from eight center seals, four wording options, and could add a Scripture verse or motto. School information, graduation date, and signature line titles are customizable. You may also add an Honors designation. There are six graduation covers to choose from, and these also may be personalized for an additional charge. It is evidence that she has fulfilled all requirements for graduation and is given with confidence that she is equipped, by the grace of God, to meet the challenges of life as an adult. The diploma we received is beautiful, and Kennady immediately took photos of it and asked if she could show her friends. Which raised several questions, since her friends all know she will graduate next year! But she was very proud and excited, and I hope it's a bit of a motivator to her when she gets bogged down with some of the coursework she's not fond of. Now about this time next year, I am certain I will be ordering Kennady's grad announcements and maybe a keepsake or two from Homeschool Diploma. She has already done a little work trying to convince me that she needs a class ring. And why shouldn't homeschool students have class rings, if they want them? Pay a quick visit to our previous review, when I added an order of personalized photo grad announcements and a senior photo portfolio. 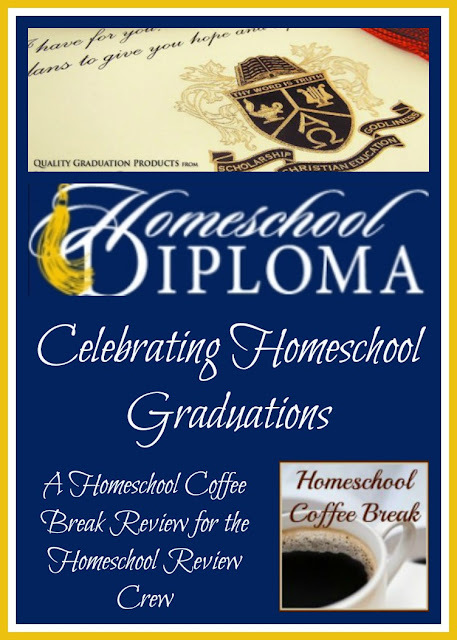 You can see it all here: Diplomas for Homeschool Grads (A Schoolhouse Crew Review). Several Crew members reviewed the Standard Diploma, and some chose another high school diploma style. Some reviewed the 8th Grade Diploma or the Cap, Gown, Tassel, and Diploma package. There are even a few reviewing the Kindergarten Caps & Gowns, because our littlest students like celebrating milestones as well! although at first glance the diploma order form looks long and daunting, in reality it was quite simple. Each step is laid out clearly with the options available, and some suggestions to help you, and whenever an option has an add-on price, it is clearly stated. Also, the order form kept a running tally of the cost of the diploma with the chosen add-ons. the customer service is prompt and outstanding! Since we had to specify that our diploma needed a 2019 date, I got a a very quick email response acknowledging that. I also found the customer service to be excellent when I was ordering other products a couple of years ago. Shipping was very quick as well, especially considering the customization of the diplomas! all the products are absolutely beautiful and of the highest quality. Our bottom line: Yes, I have to keep Kennady's diploma aside until she actually finishes high school next year, but we are so glad we have this beautiful keepsake diploma for her. It's something to look forward to, and so are the elegant announcements and other keepsakes we plan on having to mark her achievement. Pricing: The Standard Diploma starts at $29.99, and the Personalized Diploma we chose starts at $35.99. Visit the High School Diplomas page to see all the options and pricing. You can follow Homeschool Diploma on Facebook, on Twitter, and on Pinterest. Visit the Homeschool Review Crew blog for more information and to read other reviews. Crew members reviewed other products from Homeschool Diploma, so be sure to check out all the reviews! Pinned!... for 3 years from now when I'll need one.